They are physically stored with the other analysis options, this file called �analysis.cfg� is stored in the applications data directory. The exact location of this depends on the configuration of the PC and which operating system is in use. 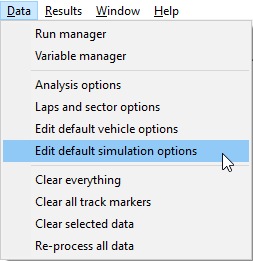 To open "Simulation Setup" window go to Data > Edit default simulation options. Note that whatever information is entered in the acceleration options, the absolute maximum rate that the vehicle can acceleration is also limited by the data that is entered in the Braking options. 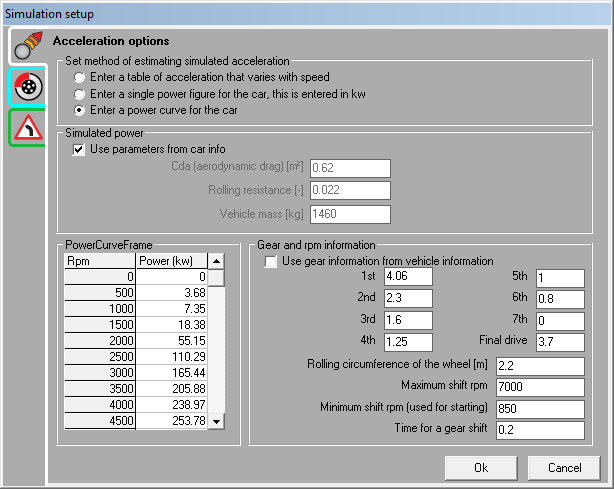 For example, if for the acceleration options entered the computer calculates that the vehicle could accelerate at 1.35g at a speed of 20kph, but at 20kph the maximum braking force is 1.2g, then the acceleration would be estimated as 1.2g and that this was limited by traction rather than engine performance. 1. Enter a table of acceleration that varies with speed. This is the simplest method available for estimating the maximum rate of acceleration. This simply consists of an acceleration that the vehicle can achieve as a function of speed. For example at low speeds high rate of acceleration are possible, as the speed increases the maximum rate of acceleration reduces, until at the vehicles maximum speed no acceleration is possible. The rates of acceleration are entered into the table, and are also shown on the graph. To edit a value in a cell, you left click on it. To copy or paste the whole table to or from excel you can right click on the table. This mode requires more information to be entered about the car, but is generally a little more accurate � but most importantly allows the user to test the effect on lap times of increasing the vehicles power, albeit in a very simple way. Of these parameters, the vehicles weight is generally known, or can be found in the cars technical data. In the case of the weight, this is the weight as it is raced, and should include an allowance for the driver and fuel etc. search the internet, in case the information has been published elsewhere. 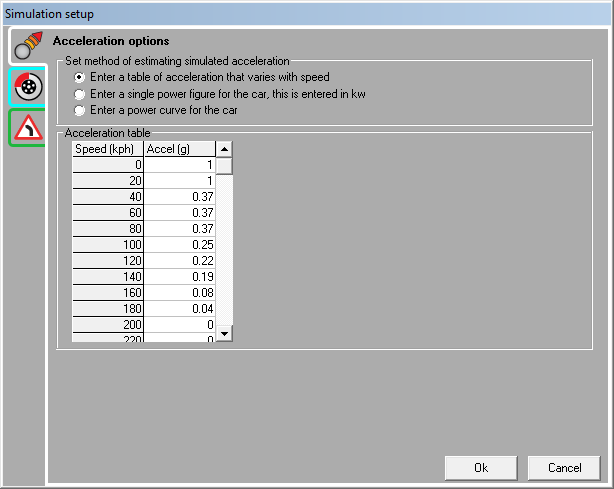 Once this information has been entered then the computer knows everything that is required to calculate how quickly the car can accelerate at any speed. Using this mode it�s very simple to see the effect on lap times of increased power output. 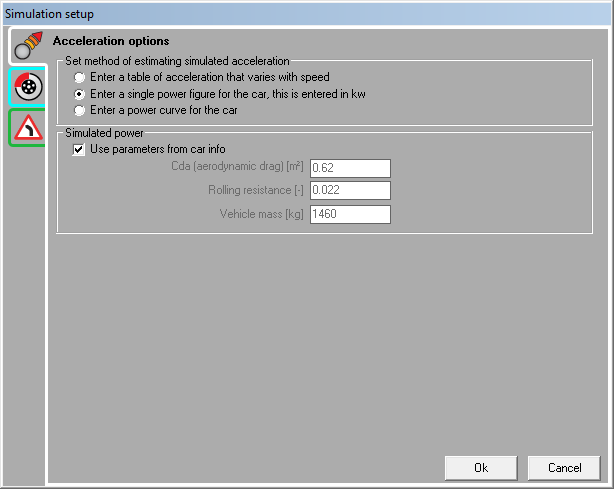 This is the most accurate and comprehensive simulation mode, but it also requires the most information to be entered about the car. The absolute maximum RPM of the engine, note that the simulation works out at what RPM to shift at for best performance � this option doesn�t get used for the RPM to shift, only the maximum RPM that is allowed to shift. The minimum RPM for the engine. This is not particularly important for most race situations, however it is used when the car pulls away from a standing start. Finally the estimated time for a gear change, this can normally be easily measured from some old race data. 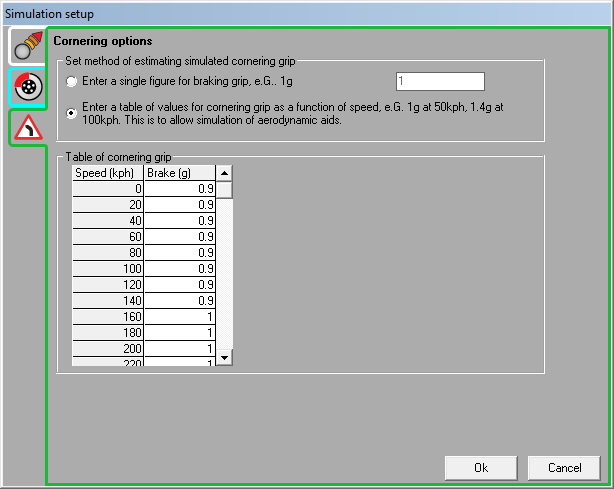 Given all this information, the computer can generate more accurate estimate for acceleration times of the vehicle out of the corners and simulate the engines RPM and what gear is recommended at any particular point. Note that when reviewing simulated RPM and gear information, they are only given when the vehicle is accelerating. During braking �0� is shown. The first option is the simplest, in this case the user simply gives a fixed level of grip that is valid at all speeds. This is a good approximation for cars without significant aerodynamic aids (wings and large splitters etc). For a typical road saloon car with road tyres this figure is �about 1g�, for a race car with slicks and no significant down force this is �about 1.3g�. By looking at old race data then more accurate estimations can be made, however these figures give a good starting point. 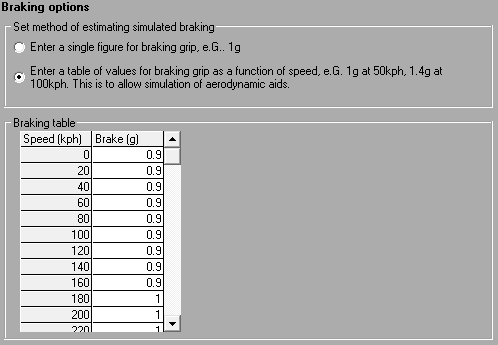 Using this mode of braking simulation, it is possible to have the maximum grip vary with speed. 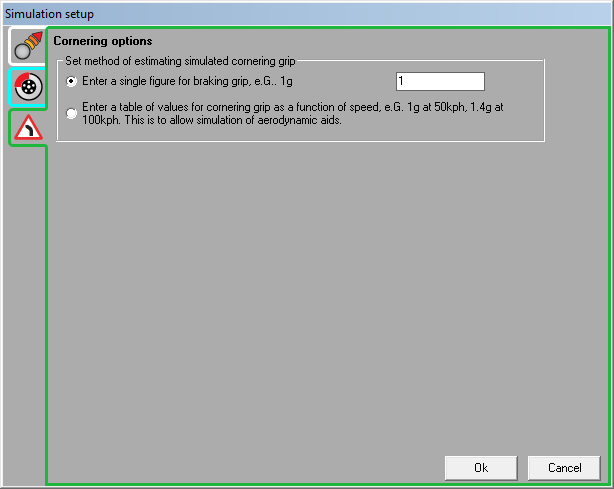 This is essential for simulating cars with large wings or splitters that generate more down force at high speeds. With such aids the vehicle is �pushed down� onto the track at high speeds which increases the grip and makes harder braking possible. To manually edit a value in a cell, you left click on it. To copy or paste the whole table to or from excel you can right click on the table.